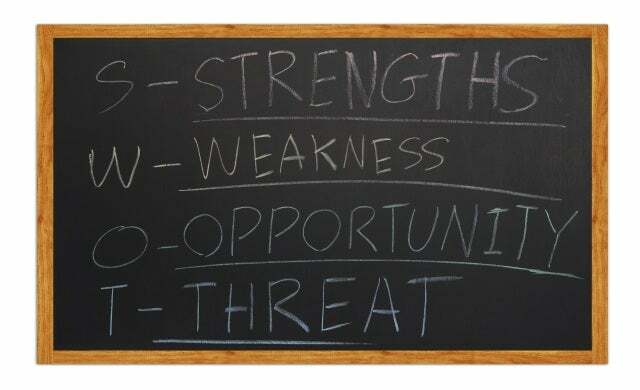 A SWOT analysis is a method for describing your business (or your business proposition) in terms of those factors that have the most impact. Essentially you nominate the Strengths and Weaknesses of the business (its internal resources and capabilities), then you identify the Opportunities and Threats it faces (factors external to the organisation). The exercise is simple: All you do is list factors in the relevant boxes. Strengths and weaknesses are internal factors; the quality of your product or the skills of your management, for example. (Both might also be weaknesses, of course, if the product quality is low and management incompetent.) Opportunities and threats are external factors, for instance the development of a whole new market (opportunity) or the arrival of a clutch of new competitors (threat). Sometimes it helps to start without the grid. List any issues at all that might affect the business – internal or external, real or perceived. When the flow starts to dry, organise the items into the SWOT categories. In the first box list all the strengths of your company. Why should you succeed? What do you do well? Why do customers say they enjoy doing business with you? What distinct advantages does your company offer? The important consideration is veracity: don’t be modest, but do be realistic. Any SWOT analysis is essentially subjective, but try for a third-party viewpoint: what strengths does the outsider see? Here’s a jump-start trick, especially for a group SWOT session: begin by brainstorming adjectives that characterize your company, write them down as quickly as people say them, and then use those words to construct a more considered profile of your company’s strengths. If you’re the sole proprietor or the prime mover in the business, try starting with a list of your own positive personal characteristics. A weakness something that seriously impedes a firm’s effective performance, a limitation or deficiency in resource, skills, or capabilities. What could be improved about the business – markets, staffing, management, control? What stumbling blocks do you continue to encounter? What does your company do that can be improved? What should be avoided? What do your competitors do better than you? Don’t try to disguise weaknesses, and don’t merely list errors, omissions and mistakes. Look at things from the outsider’s perspective, too. For instance, a one-man business might list the proprietor’s knowledge as a strength; the outsider might see total reliance on one individual as a weakness. Where are the openings for your business? What customer needs are not being met by your competitors? You’ll probably start with marketing issues, presumably because your business fills a niche or can compete effectively, but do include all the possibilities. For instance, what are the interesting trends in your business sector – in terms of markets, yes, but also in technology changes, the legislative and regulatory environment, social patterns? Threats are key impediments to the firm’s current or desired position. What are the more obvious obstacles in your way, both actual and potential? Obvious candidates would include a sudden rush of bad debts or a slack sales period leading to cashflow problems. But think further than that: What is your competition doing that could take business away from you or stunt your company’s growth? How might your competitors react to any moves you make? What trends do you see that could wipe you out or make your service or product obsolete? Might technology changes threaten your products or services? Or your job? It’s important to include a couple of worst-case scenarios. Weighing threats against opportunities is not a reason to indulge in pessimism; rather, it’s a question of considering how possible damage may be overcome, bypassed or restricted.